It was a case of down but definitely not out as a Rafael Nadal kept picking himself off a slippery and dusty centre court surface. He stormed into the Wimbledon semifinals in London on Wednesday with a pulsating 7-5 6-7(7) 4-6 6-4 6-4 over Juan Martin del Potro. Just 90 minutes after defending champion Roger Federer was sensationally knocked out by South African Kevin Anderson 2-6 6-7(5) 7-5 6-4 13-11 in four hours, it seemed as if the grasscourt major would lose its top two seeds as Argentine Del Potro took a two-sets-to-one lead. But just before that game started, Federer's shock demise was flashed up on the giant on-court scoreboard and it was as if that threw the Spaniard off his stride and he fluffed his lines to drop his serve. "Now is the moment to enjoy but start to recover, it was a tough physical battle," the Spaniard said. "The opponent that is coming one of the toughest. I am just excited to be in the semis. I need to recover to give my best." Next up for Nadal is a blockbuster last four showdown with Serb Novak Djokovic, who returned to a Grand Slam semi-final for the first time since the 2016 U.S. Open, beating Japan's Kei Nishikori 6-3 3-6 6-2 6-2. 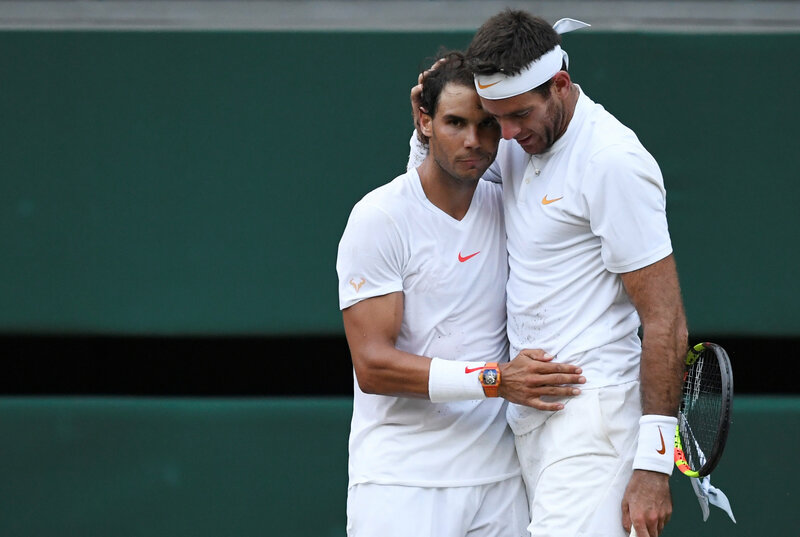 The three-time Wimbledon champion looked in impressive form, particularly when he closed out the final set in ruthless fashion to set up a blockbuster semi-final with Nadal. South Africa's Kevin Anderson will next face American John Isner, who overcame Canada's Milos Raonic 6-7(5) 7-6(7) 6-4 6-3 in the battle of two of the biggest servers in the men's draw on Wednesday. 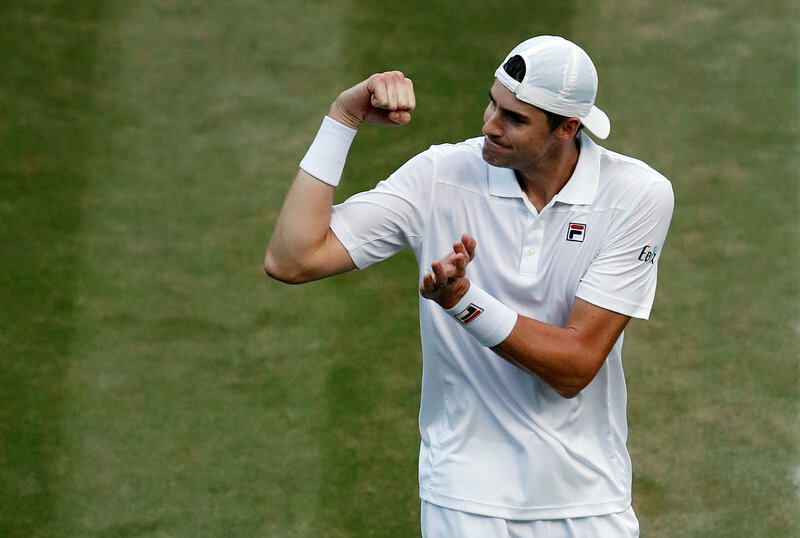 Isner saved two set points in the second set tiebreak to avoid going two sets down and then took control of the match to continue his dream run at the All England Club. He has taken 41 Grand Slams to reach his first semi-final - one less than compatriot Sam Querrey who reached the milestone a year ago at Wimbledon. Isner had never gone beyond the third round at Wimbledon in nine previous attempts but has been in sparkling form this time. He wobbled when serving at 5-4, a double-fault giving Raonic a rare break point, but salvaged the situation with a booming ace before moving a set from victory.